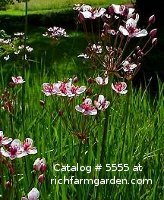 Butomus, also named Flowering Rush, is a lovely hardy aquatic plant, a native of Europe and Asia belonging to the family Butomaceae. It has long sharp edged leaves and heads of rose colored blooms topping the foliage in summer. An excellent waterside plant, it lends beauty and will thrive in boddy conditions.